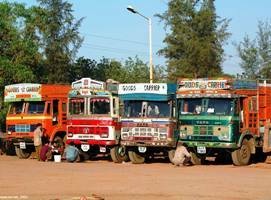 CHENNAI: Truck rentals went up in September despite the auto industry going flat a sharp increase in fuel prices. According to an IFTRT report, truck rentals went up by 5%-6% in September even as there was a Rs 4.60 /litre rise in diesel price during the same period. Right now, diesel costs Rs 74.20/litre (in Delhi) from Rs.69.60/litre on September 1, 2018, which is the sharpest rise in fuel price during last nine months since January 2018. Nevertheless, truck rentals are up on the back of “buoyant double digit increase in cargo offerings from factory gates with steady flow of fruits, vegetables, food products and poultry items along with constant engagement of truck fleet in infrastructure sector, which has boosted the sale of high tonnage M&HCVs sales during September 2018,” said S P Singh, senior fellow and coordinator, IFTRT. Although in some pockets of the country road traffic got disrupted when heavy rain lashed hilly areas of north as monsoon was on withdrawal mode. The data shows that in the last three quarters truck rentals have outpaced diesel price increases since January 2018. Normally, about 70-75% of the truck rentals in the open market load are fixed by goods transport agents and truck unions in different parts of the country, while 25%-30% of the goods transportation business is contractual based on annual or multiyear rate contract between transporters /common carriers and Corporate /PSU consigners in the country, said Singh. As diesel price revision is part of the variation clause / escalation clause of the transportation contract, diesel price rise is smoothly passed on to the end consumer.